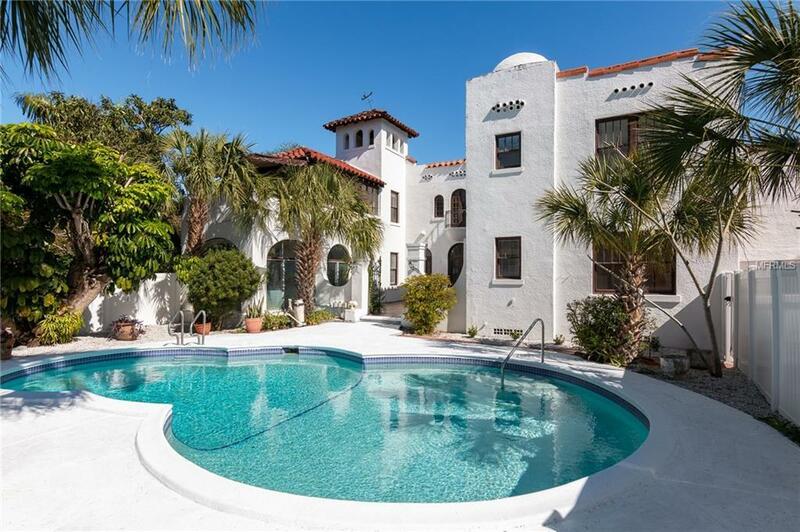 This elegant 1925 vintage Spanish style home is located in St Petersburg limits. The spacious and light floor plan features a large formal living room with fireplace, formal dining room with triple French doors to pool courtyard, secondary family room with fireplace, eat-in-kitchen that is the main access to two bonus rooms upstairs above garage, sunroom/office with balcony overlooking the pool, driveway with side entry to pool patio. Original period details include hardwood floors, French mosaic ceramic floors, 2 large fireplaces, and glass windows. The two car garage has additional laundry room with sink plus another adjoining storage building. The oversized lot offers privacy around the in-ground pool and patio and mature landscape. The neighborhood is a quiet oasis in a bustling city.